We all know that when you hold a seashell to your ear, you can hear the sound of the ocean. But we bet you didn’t know that scallops, too, capture that soothing sound while they’re still in the shell. Or so we’re told. As Bryn Williams explains in The Perfect Ingredient, “Some folks hold that scallops really do sing. Fishermen of legend have sworn that they have heard their song. Science may tell us that’s merely the whooshing sound they make as they propel themselves along, but I prefer the singing version of the story myself!” We’re with Williams. What can we say, we’re romantics. We’re also fools for sea scallops. 1. Bring a pot of salted water to a boil. Add your asparagus and leeks and cook just until just barely tender, a couple of minutes at most. Drain and pat dry. 2. Get a large skillet hot and then drizzle it with just enough olive oil to coat the surface. Sizzle up your asparagus and leeks, working in batches so there’s but a single layer of vegetables, until lightly colored on all sides. Transfer the asparagus and leeks to a large bowl. Rip half your herbs over the top, add a squeeze of lemon juice, and gently toss. Set aside. 3. Get the same skillet nice and hot. Score one side of each scallop in a criss-cross fashion, slicing almost but not quite halfway through each scallop. Season the scallops on both sides with salt, pepper, and five-spice powder, if desired. Carefully drizzle the skillet with just enough olive oil to coat the surface. Add the scallops, scored side down, and sear, untouched, until they’re golden brown and easily come away from the skillet when you tug at them with tongs, about 2 minutes. (As with the vegetables, you may need to work in batches to avoid crowding the scallops, which would cause them to steam.) Flip the scallops over, add the rest of your herbs, and cook to the desired doneness, about 1 minute more. 4. Divide the asparagus and leeks among 4 plates. Top each portion of veggies with some of the scallops. If a rich pan sauce is desired, add 2 good pats of butter and the juice of ½ the lemon to the skillet, shake the pan about until the butter melts and, if desired, turns slightly brown, and then dribble a little of the pan sauce onto each plate. Cut the remaining lemon into wedges and place a wedge on each plate. Serve immediately. 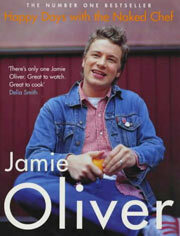 I have been making this Jamie Oliver recipe for several years–I had been at a friend’s house and seen the Jamie Oliver cookbook and asked if I could write down this recipe. I’d always been afraid of making scallops, as it sounded like a hard thing to do well, but I wanted to try it, so this was my first scallop recipe–and it is always wonderful. I have used marjoram and summer savory and both work great, although I’ve also used sage and basil (according to what I find fresh at the market) and still loved the outcome. I hadn’t made this in a while, so I made it again last night. Excellent, as always! Gosh, I love it when I test a recipe that’s perfect for a weeknight–something that’s simple and easy yet looks and tastes wonderful. I served this over a bed of rice noodles, and it was a perfect combination. The asparagus was cooked to perfection, the aroma of the leeks and herbs was infused throughout the whole dish, and the scallops were juicy, tender, and tasty. 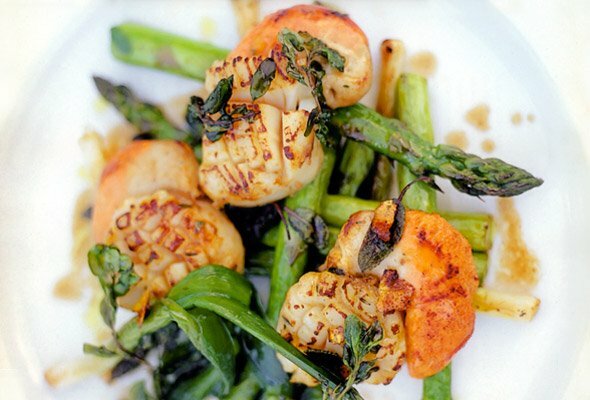 Scallops, asparagus, and leeks are a combination that beg to be savored! The herbs add a wonderful, summery flavor and really bring the whole combination together. I couldn’t find “baby” leeks, but the smallest ones I found were quite fine, and only needed an extra minute or two of blanching. My asparagus spears were rather thin, so I added more to each plate. With fresh vegetables like this, it doesn’t hurt to have a few extra. I couldn’t decide on marjoram or summer savory, so I used equal portions of both. I also think that a touch of tarragon would be great in this. The five-spice was also a nice touch, and I would not consider the butter optional. I served this with a nice roasted onion focaccia to allow us to soak up the wonderful pan juices on the plate. This was very good, in spite of me. I bought what looked like very thin leeks–they turned out to be leeks that had a tough inedible stalk in the center. But the outer leaves were fine, and certainly baby leeks would be much better. Scoring the scallops made them very pretty and the five-spice powder added a lovely flavor. Simple, easy, and delicious. Next time I might try subbing scallions for the leeks since they are a little easier to find. And I thought the butter was not really necessary, so it could be made even lighter. Great for springtime or any time! Pan-Seared Scallops with Asparagus and Baby Leeks Recipe © 2002 Jamie Oliver. Photo © 2002 David Loftus. All rights reserved. All recipes and photos used with permission of the publisher.